Mankato: Brunton Architects – Brunton Architects, an architecture and interior design firm, opened in February 2008 in the Community Bank headquarters building in Mankato. Mankato: RE/MAX – Patti Schuch opened a RE/MAX franchise a year ago at 1635 North Riverfront. Before getting there, she had quite the experience growing up. In an era of big-box stores and impersonal service, Dr. Viktoria L. Davis enjoys providing individualized eye care to patients who recognize her as a fellow resident of Madelia, population about 2,200. Her patients see her with her family in the grocery store or at Madelia Public Library. In addition to her professional website, there’s a personal website loaded with family photos and only one picture of the optometry office. Her patients are eager for this glimpse into the life of Viktoria Davis, wife and mother. It’s obvious, too, which website she values more. “Once an Eagle Scout, always an Eagle Scout,” says Jonathan Zierdt, a boyish grin spreading as smeared peanut butter and jelly all over his facial features. 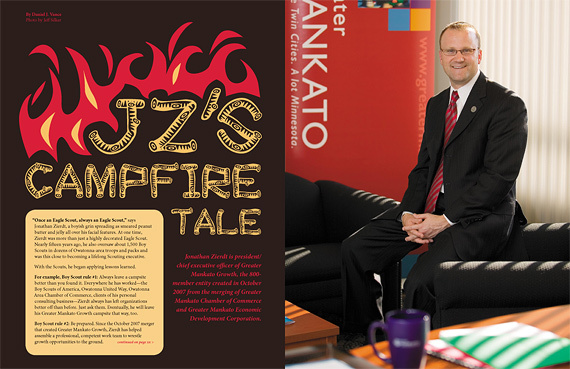 At one time, Zierdt was more than just a highly decorated Eagle Scout. Nearly fifteen years ago, he also oversaw about 1,500 Boy Scouts in dozens of Owatonna-area troops and packs and was this close to becoming a lifelong Scouting executive. With the Scouts, he began applying lessons learned. Inhale, exhale. Inhale, exhale. That’s it, nice and slow. Now repeat after me, “O—Mau—Nee—May—Paw—Dra—Oom.” Again, and keep breathing – in, out, in, out. There, now don’t you feel better? Chris Wiener’s effortless, boyish smile never seems to fade, and neither does Lady and Champ’s enthusiasm for ear scratching, nor the autumn sunlight piercing the rear barn window to warm a deserted barn-wood chair. The idyllic setting could have been an inspiring Norman Rockwell Saturday Evening Post cover.